Goodness, confining growing autumn raspberries sounds much like the way I grow phyllostacys bamboo! 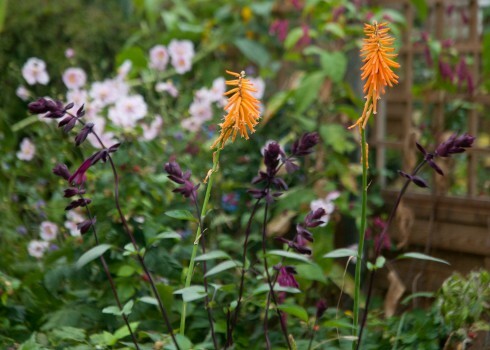 The plant fair sounds inspiring and I love the kniphofia ia/salvia combination, gorgeous contrast of colour and form. Yesterday we drive past quite a wild but stunning looking bank of these orange pokers left to grow in rough grass – stunning. As you say, oh for another half acre! Hi Kate, Luckily raspberries rather easier to dig out than bamboo, but they are nippy little travellers! The plants fair was fantastic. 23 great specialist nurseries, from France, Germany, Holland and the UK, really informative bite-sized talks and a really chilled atmosphere-gorgeous weather didn’t hurt either. Really appreciating these lovely kniphofias. Great Dixter also grows a Kniphofia uvaria Nobilis which is a bit of a beast, but great for height and flaming colour at the back of a border. I moved Autumn Bliss last year as it was travelling under concrete paths and appearing further along the garden. I grow Polka too and prefer the flavour, both are supposedly corralled in raised brick beds now, we shall see. The trip to East Malling sounds good, did you have a favourite raspberry? Hi Julie, we were tasting new plants yet to be named and tagging the best tasting ones as we went along. 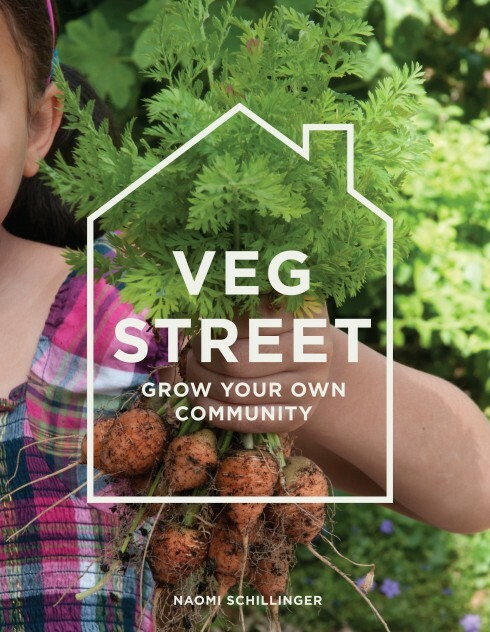 Trials can start off with 8,000 different plants (all grown from seed) and gradually they narrow it down from there to find new tasty varieties, with a good shape and size. Really interesting to see how it’s all done. We planted six canes each of Autumn Bliss and Joan-J earlier this year and they’ve already started shooting up all over the place. I didn’t think this through… Oh well, we’re enjoying the fruit at the moment and I’ll deal with the unwanted shoots when it’s time to cut them back. 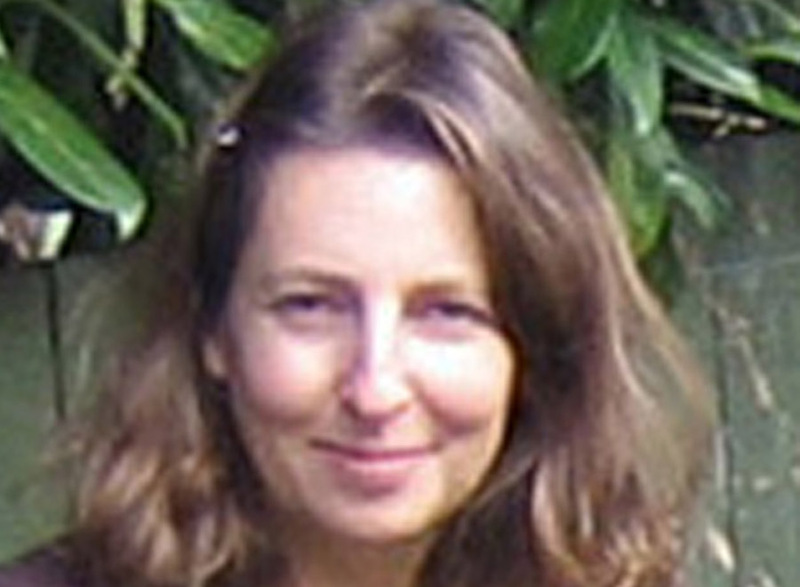 Your time at the Great Dixter Plant Fair sounds great and I love that salvia. How interesting about the Aster pistils. Nature’s brilliant. Hi Sam, yes, nature is brilliant indeed and I can see on your coastal blog that tyou’re a tad partial to an orange and purple combo too! Joan J and Polka seem to be the best tasting varieties about at the moment, but it was great to visit EMR to see how they go about developing new varieties. I’m going to have to take drastic action with my raspberries too Naomi, my back hurts just thinking about it. 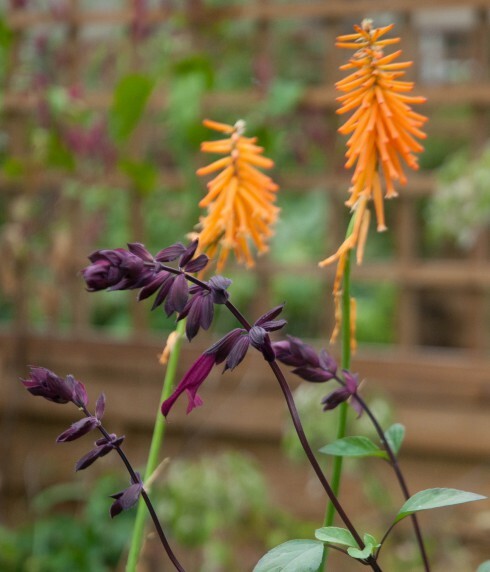 That salvia is a glorious colour, and looks fabulous with the kniphofias. A small price to pay for having to don clothes. Or just strut your stuff in your pjs like the do in Liverpool? Raspberry-picking onesie anybody?! Hi Janet, I have ventured out to the front garden in my pyjamas, but I don’t want to get into the habit!.Might never bother getting dressed! Luckily raspberries are so shallow rooted, so actually looking forward to getting them all dug out to make room for my new lovelies, and will have some spare canes no doubt to share with neighbours too. 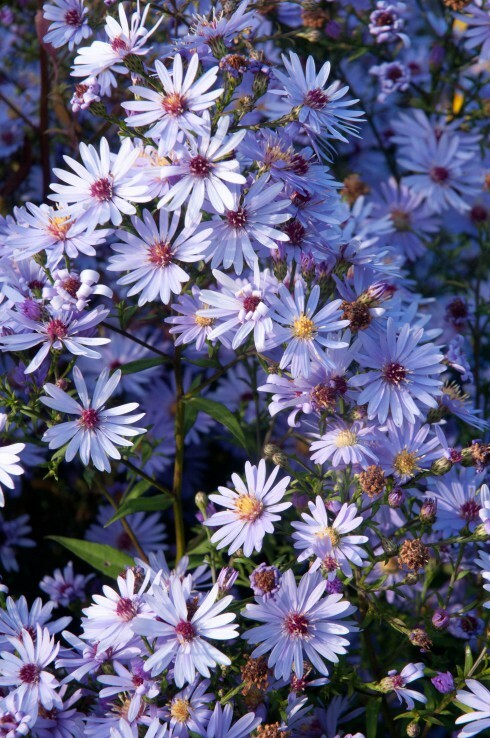 I’m thrilled to know about the Asters and the bees! We too went to wonderful Dixter on Saturday and came away with lots of irresistible plants but the one that really fascinated was the small white Aster with different coloured pistils. Now I know and it’s brilliant! 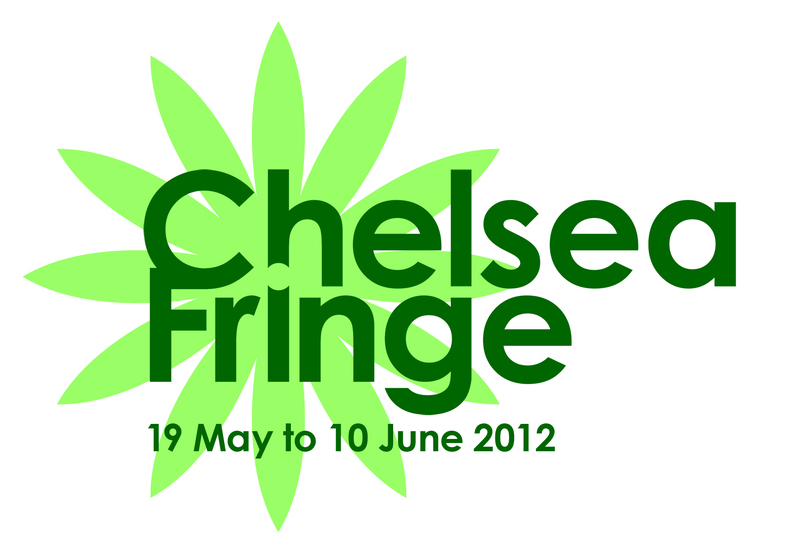 Isn’t that the best plant fair of all? Fascinating – I wonder how many plants have that pistil change. I’ve seen it happen with apples, pears and roses and wondered if it was a sign the flowers had been pollinated. It looks like a number of us are contemplating moving our raspberries – I am too, so I have room at the top of my plot for the local farmer to deliver a trailer load of manure. I’ll be planting them with some barrier fabric too, I had wondered about a rubble bag I have, but I suspect they’d grow through that like it wasn’t there. Hi Michelle, raspberries do seem very adept and squeezing through available gaps, so I reckon root barrier fabric is the way to go. You could use a flexible pvc root barrier. I’ve had to use it for wandering bamboo. It’s not as pretty as slate but is flexible and so goes round corners. All sorts of bamboo websites sell it on a roll. Not expensive. Presumably you’d only need it 45cm deep and you could slice it up and give your mates pieces if they have similar probs. It’s also quite discreet, protruding only a couple of inches above the soil surface. Thanks Ian, yes, this seems like a good option and could contain the roots in whatever shape the raspberries have grown to. I’m sceptical about root barrier fabric after seeing a pink Japanese anemone pushing offshoots up through it. 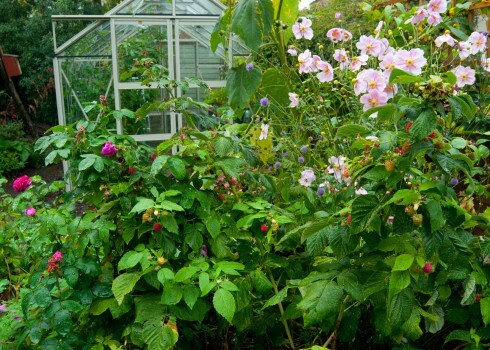 Hi Diana, Ian, above, suggests a pvc root barrier, so I might give both pvc and material barriers a go and see which works best as raspberries aren’t deep rooted and can spread over a long (and thin) area which might take quite a few pots. I couldn’t agree more, as lovely as it is to pick a handful of raspberries in the morning these girls just don’t show any sense of modesty whatsoever – I have just moved one to a gravelly patch by the shed where I don’t have anything else. Solitary confinement may work. Hi Anne, Yes, you’re right. Definitely better in their own little spot than mingling with more delicate plants that they can happily weave their way through (and then obliterate). Hope yours flourish in isolation next year. 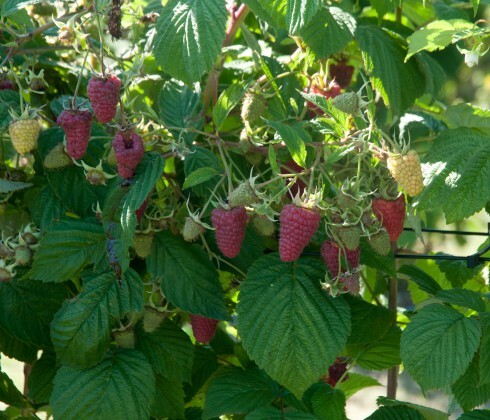 Note to self … must grow Autumn raspberries, mine are all done by August, and then there s such a long wait! Hi Jane, just picked a delicious bowl of raspberries from the back garden this morning (don’t mean to rub it in) as the canes seem to have really hit their stride over the last couple of weeks, providing bountiful amounts of these great fruits. ‘Polka’ and ‘Joan J’ definitely worth growing and Lubera have given me an ‘Autumn Amber’ orange variety to trial for next year too. Easy to grow, no need to stake them and supplying the most tasty berries when most others have finished for the year-what’s not to love! All of this talk about growing raspberries is making me feel bad for having not grown some of my own… clearly I am missing out! Hi Angie-Now’s the perfect time to order your own raspberries-Would definitely recommend growing ‘Polka’and ‘Joan J’. Plant canes this winter and you’ll have bowlfuls for your breakfasts next autumn…..